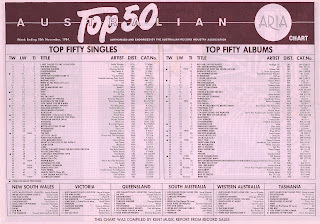 Australians have always loved to laugh, never more so than in the mid-'80s when stand-up comedians were regulars on the ARIA singles and albums charts. This week in 1984, possibly my favourite comedy record from that entire decade debuted. Yes, I know, I've banged on and on about how much I hate novelty records previously, and it's not like I went out and bought this single, but there's an exception to every rule. And this top 10 hit (and not, despite claims online, a national number 1 record) is it. A song that did reach number 1 on the ARIA top 50 was still there this week in 1984. "I Just Called To Say I Love You" by Stevie Wonder spent its fifth week on top. Taken from her third album, The Magazine, "The Real End" was Rickie Lee Jones's return to the Australian top 100 following her one and only hit, 1979's number 15 "Chuck E's In Love". Not released as a single in the US - the title track was issued there as the follow-up to "All Of You" instead - this tropical-tinged track did much better in Europe than Australia. "Temptation" aside, Heaven 17 were finding it hard to come up with another top 50 single, a problem that persisted with this bouncy lead release from third album How Men Are. The clue was in the name. Masquerade was actually a pseudonym for German singer/songwriter Drafi Deutscher, who collaborated with Christopher Evans-Ironside on this synth ballad, which had been released in Europe about a year earlier. In a Milli Vanilli-esque move, however, the two men in the clip below - a TV performance which became the song's de facto music video - weren't Drafi and Chris, but two randoms chosen to lip sync along to the song. As well as taking its time becoming a hit in Australia, "Guardian Angel", was a slow burn on the ARIA chart, not reaching its peak until its 13th week inside the top 50 and spending just over half a year on the top 100. It's funny how you can know a song for decades without actually knowing anything about the act behind it. That's the case for me with this pre-rock'n'roll era-style tune by Australian band Non Stop Dancers. For one, I didn't know the band's frontman, Larry Van Kriedt, had briefly been a member of AC/DC (and also The Eighty Eights, who I've never heard of before). I also wasn't aware Non Stop Dancers were based in Newcastle and that "Shake This City" was a much bigger hit on the NSW chart than elsewhere in the country. That fact does explain why it looms larger in my mind than a number 44 single normally would. And I didn't know there was a follow-up single, "Mobbing Me", and album from Non Stop Dancers, neither of which charted. Here's another song that always seemed to me like a bigger hit than it was. Berlin's second top 40 single, "Dancing In Berlin", didn't do anywhere near as well as "No More Words", but for me it was the better song, ending up among my favourites for the year as a whole. Another slice of perfect synthpop, the song deserved a much warmer reception. We wouldn't see Berlin back on the top 50 for almost two years - and when we did, it would be with a very different type of song. Next up, a very different type of song for the man who was coming off four consecutive top 10 hits, including chart-topper "When Doves Cry". Mega-ballad "Purple Rain" was the title track of Prince's hit 1984 album and a major moment when it was performed in the movie of the same name. But despite being one of his best known songs, it didn't even make the top 40 locally. The usual reasons apply here - it was the third single from Purple Rain, a number 1 album that hadn't left the top 20 since July. But the song's lack of success could also be due to the fact that it was nothing like his party-starting hits. That fact worked in its favour decades later when "Purple Rain" shot to number 3 in the wake of Prince's death in 2016, just as the similarly downbeat "Man In The Mirror" had become a far bigger chart hit posthumously than it was originally for Michael Jackson. At the risk of sounding like a broken record, comedy records aren't among my favourite things. Don't get me wrong - I do have a sense of humour and love a good stand-up routine. But once you've heard a joke, I don't understand why you'd want to listen to it again and again. That all said, as comedy records go, "I'm Tuff" is one of the better ones. Why? Because it's laugh-out-loud funny - a three-and-a-half minute routine of rapid-fire one-liners about how tough (sorry, tuff) comedian George Smilovici is. 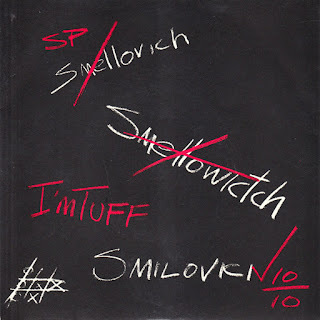 Listening to it again now for the first time since the mid-'80s, I'm pretty amused, although I do recall more punchlines than I would've thought. Like "Australiana", "I'm Tuff" was recorded as performed and features an appreciative audience who whoop, holler and scream out, "How tuff?" at all the right junctures. Unlike Austen Tayshus (whose second hit was just a few places above this week), George didn't return to the top 100 with any of his subsequent releases, which included singles titled "Popularity", "Beyond Tuff" and "Spewin'". Next week: a massive 10 new entries, including a number 1 (that would dethrone Stevie Wonder), a number 2 and a number 3, my personal favourite song for 1984, the best song by the best-selling duo of all time and the chart debut for the son of a music legend. Interesting how chartwise Purple Rain wasn't popular cause of it's low chart position but because of the immense notoriety of the Purple Rain album, the song was widely played and known.